We’ve talked (okay, bragged) about it. We’ve published highlights. We ate all of Aldi to do this. That’s right, you have come to the World’s Most Comprehensive Guide to Aldi Products: Breakfast Foods. They say breakfast is the most important meal of the day, so let’s see what breakfast foods should be next on your list. An excellent alternative to the name brand! Aldi for the win! Switch to save!!! 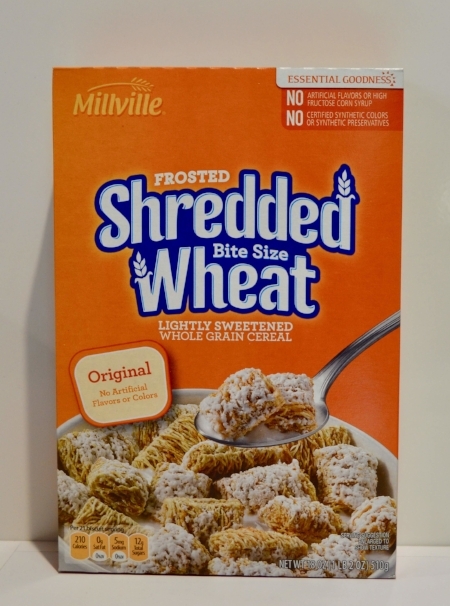 Aldi has done an excellent job on recreating the classic taste of Frosted Mini Wheats with their Frosted Shredded Wheat. All of our testers would switch to save! Seriously a great dupe! We could not even tell the difference in taste and smell. The store brand was a little puffier if that's your thing. We honestly couldn't tell the difference in these two cereals. Simply Nature Shredded Wheat has a harder crunch, which we really enjoy for our cereal. This is a great opportunity to switch to save! We were not impressed on the packaging of either, but Kellogg's Frosted Flakes did have a more consistent flavor on each flake. With a little sweeter smell and a little chewier bite, we were motivated to stick with the original. Aldi has put forward a strong challenge to the Cap'n! Our reviewers judged these two to be extremely similar, with the largest difference being the stronger fruit smell of the store brand. The taste and texture, however, are spot on. Well played, Aldi. Sally forth to savings! All of our testers would switch to save!!! Millville does an excellent job recreating the taste and texture of Kellogg's Brown Sugar Cinnamon Pop-Tarts. Across the board, our panel would switch to save with Millville's Honey Puffs! There is a slight difference in airiness, Honeycomb had an airier bite to it. Breakfast Best had a more buttery smell and slightly sweeter taste. Switch to save! Excellent opportunity to save! The name brand has a few more flax seeds but the products are very similar overall. All testers said they would switch to save. Thomas' English Muffins were slightly more sour, but everyone still enjoyed the taste and texture of L'oven Fresh English Muffins. The marshmallow powder might fly your way while opening the generic, but for this classic childhood cereal, Aldi held its ground. Lucky Charms has more bite and could hold up better in milk. 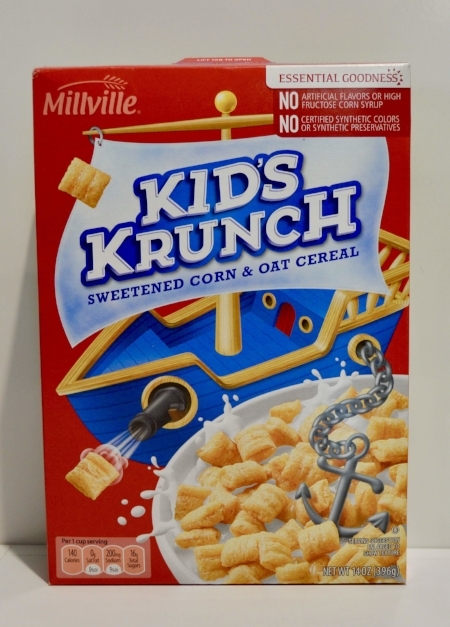 You might miss out on some raisins when eating the generic but overall Millville does a great job on recreating the taste of Kellogg's Raisin Bran. Great dupe! We noticed some minor differences in the toughness of the granola, the generic is harder. But the most pleasant surprise was that increased amount of chocolate chips in the generic. Great job Millville! Great dupe! Millville Bran Flakes has a much thicker texture and sweeter taste, which we think works great in milk. Gotta avoid that soggy cereal! This would be a great opportunity to switch to the store brand. When looking for fruity loops, you could definitely fill your craving with Fruit Rounds. Our only complaint would be the packaging, since the rounds were stuck together. The strawberries in the Quaker brand oatmeal were very pink, in an unnatural way, but looked more appetizing. Quaker brand was much thicker too. The tastes of both were so similar though! So we would for sure switch. Great time to switch to save! The name brand had a sweet smell that made our panel think of blueberry muffins and the more natural blueberry taste of Benton's was a plus. Let us know what you think! This panel would switch to save! The store brand has a more pleasing and sweeter smell, so that's pretty sweet. Much more peaches in the store brand! So we think that makes the store brand taste more delicious, and it's thicker too. Both these brands taste very similar, but the textures are way off! We preferred the harder clusters of granola in the name brand to the lighter, rice puffs of the store brand. We don't think we would switch in this case. Great opportunity to switch to save! The taste of both are way similar. But when it comes to packaging, you may prefer Kellogg's because of the level of games provided on the back of the box. We would switch! The name brand has a hint of sweetness, but there are larger seeds which creates a texture we weren't as into. We would totally switch to save! The store brand looks more appetizing and has a more consistent sweetness. The name brand is mainly corn flakes that are harder. Another job well done by Aldi. Millville Cinnamon Crunch Squares held up well against Cinnamon Toast Crunch but there are clear difference in the flavoring. You can expect a stronger cinnamon smell and taste with the name brand. The Millville Corn Squares held up well to the General Mills Corn Chex but our panel was split on switching to save. Corn Chex does have a sweeter smell and more taste then the Corn Squares, while the Corn Squares had an airier density. This is a great dupe! The store brand is packed with way more clusters and has a stronger coconut smell. This may not be one of those times where you want to switch. Kellogg's Raisin Bran has a lighter crisp and more natural taste, while Millville has a harder crunch. That harder crunch may be more ideal though. Whether you want to stick to the name brand or switch & save depends on the sensitivity of your sweet tooth! Some of our reviewers thought the Kellogg's Corn Flakes were noticeably sweeter, while others hard a hard time telling the difference. The texture is the same, so it's really a question of how sweet you like your cereal in the morning (or any time). Most of our testers were not able to tell the difference between the two products, although there was a major difference in smell for most of our testers. This might be an opportunity for you to switch to save! We thought the store brand had a strong maple smell and had a harder crunch. The name brand had a lighter crisp and was less sweet. We were a little split on whether or not to switch, but the taste overall is very similar. Clear differentiators when testing these products were the taste and the texture. Both are easy to prepare in the microwave, although they needed different amounts of time to cook. There is more bite in every bite with the name brand. All testers said they would not switch. The store brand is more difficult to open and has a plain oat smell, moisture in the bag and few chunks. The name brand has a sweeter smell, more chunky, but the raisins settle at the bottom. Both testers said they would not switch. Nutri Grain has more jam with a stronger jam taste. Fruit & Grain's jam is more absorbed into the breading crust and has more of a grain taste. 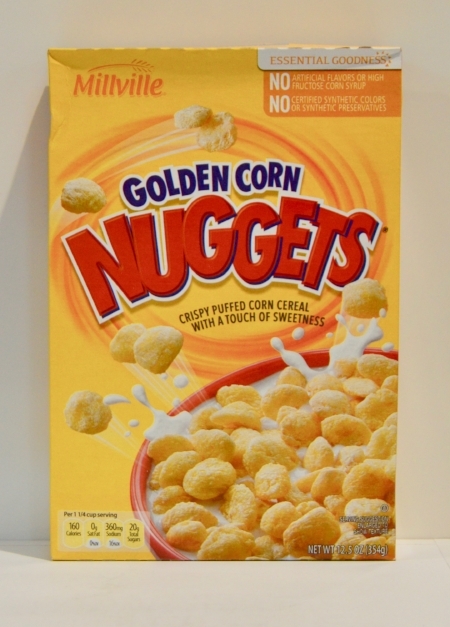 Our panel was not convinced by the sweeter taste and too crunchy texture of Millville's Golden Corn Nuggets. If you are looking to replace Corn Pops, this may not be the solution for you. Our testers noted a difference in smell and taste. Millville's Kookies had hints of honey while Cookie Crisp was sweeter overall. Two out of three testers said they would not switch to save. The Cheerios looked more appetizing and are sweeter than Millville. Plus, they have a more powdery texture. These bars are similar in texture and smell, but the Special K bars have a little more sweet strawberry flavor. Splurge if you've got to have your strawberry fix. This was a classic split. We liked aspects from both brands. Special K smells more like strawberries and has a lighter crisp that is very satisfying. The taste of the Fit&Active brand was very similar to Special K.
Our panel was split on switching to the generic. The name brand has a fruitier smell and more filling, leaving you with a more flavorful taste. But if you prefer a crispier pastry, you might prefer the generic. The tastes of these two brands were very different! The store brand has a nice sweet aroma, but the taste was a little bland. The name brand has a nuttier smell and sweeter taste. We definitely preferred the taste of the store brand; the taste was so similar to the name brand. We really liked how much granola clusters were in the store brand cereal. The name brand has more flakes, so if you prefer a cereal with granola clusters then this would be a good opportunity to switch to the Millville's Banana Nut Granola cereal. Our panel was split on this testing. The name brand has a stronger cinnamon smell, but the generic has a strong graham cracker taste and crispier texture. Depending on your preferences, let us know what you think below! Don't be confused by low scores, testers PREFERRED the generic granola. The store brand had a more pleasant smell, a sweet smell of cinnamon and spice. This brand was also crunchier. The name brand has more clusters but was chewy in comparison to the store brand. Immediately you will notice a difference, the name brand contains coconut and the store brand does not. The cereals are distinctly different but both are pleasant. Our panel recommends switching to save if you do not enjoy coconut! Testers were not impressed! They thought the store brand tasted more artificial, like a candy apple. Stick to that real apple cinnamon goodness of the name brand! Our panel would not switch to save, the texture and the taste was just not as comparable as we would have hoped. The bear naked granola has a stronger honey smell and taste that we would miss with the generic. Our testers found that Honey Nut Cheerios had a sweeter and more pleasant smell than the generic. And some of our testers felt quite strongly that the taste of Honey Nut Cheerios was much better than the Honey Nut Crispy Oats. Most of our testers would not switch to save. No testers on the review panel would switch to save. They said the generic bar tasted like artificial cherry, they noted a thick bread and gummy paste inside. Best to stick with the smoother, fruitier name brand. Our testers felt strongly that Kellogg's is the way to go! Millville misses the pastry to jam ratio that we know and love from Pop-Tarts. Stick with the original on this one. The store brand is very bland and tastes more like oats. This may not be a good opportunity to switch to save. The name brand was a tad sweet. Stick with the original! Immediately you will notice a sweeter smell from Reese's and with the first bite you will miss the flavor on Millville's Cocoa Peanut Butter Puffs. Our testers all agreed, stay true to the name brand. The name brand really packs a powerful punch when it comes to flavor. There's more of a spice aroma compared to the store brand. The store brand had less in its packet, making the cooked oatmeal more watery. We thought the name brand tasted better and enjoyed the clusters and sour taste in the apples. The store brand tasted more stale with less flavor, so this may not be an opportunity to switch to save.